Club Penguin Cheats by Mimo777 Club Penguin Cheats by Mimo777: Ewww! Smelly Club Penguin! 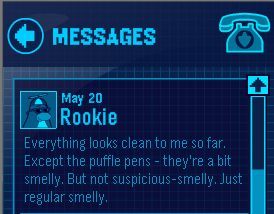 LoL, Rookie is suspicious, But that's good, Club Penguin must be Safe for us! Ew! the puffle are nasty! also everything is showing up as undefined. am i alone? Dosen't Rookie sound a bit suspicious? Mabey he IS working for herbert, and he hid something in the puffle pens! :O Oh why Rookie!? thx rookie! now we no somethings up! we can always count on him to give us the wrong answer! No no Rookie is with the EPF not Herbert lol!